The past couple of weeks have been a bit of a blur - moving offices, heaps of social engagements and a nasty bout of the flu. So obviously my normal cooking routine has gone out the window, in favour of canapes, dodgy non-Japanese Japanese takeaway and other not-so-fabulous options. Now that things have calmed down a bit, I'm making a concerted effort to cook and eat a bit better! I realised that one of the main barriers to my cooking most nights (and this comes from a girl who obviously, loves to cook!) is having to actually choose what to cook. Sounds silly, I know, but often on a weeknight I'll have the time, but won't be able to decide on what to make. And by the time I've dithered about it enough it's 7:30 and I then I'll just go and get some takeaway. On Tuesday at work, I thought: enough! I decided to make something that I've wanted to for ages, but never got around to - Nigella's double potato and halloumi bake, from Nigella Bites. I decided on the recipe during the day, bought the ingredients on the way home from work, prepared it when I got home, and BAM! Dinner was on the table in an hour. Even managed to have a shower and do the dishes while it was cooking. It's ridiculously easy. Just chop up a couple of potatoes (both sweet and normal), a capsicum, a red onion and chuck them in a tray with a bit of oil and some unpeeled garlic cloves. It goes in the oven for an hour. For the last 10 minutes or so, you turn the heat right up and cover the lot in thin slices of halloumi, letting them get all melty and crisp. 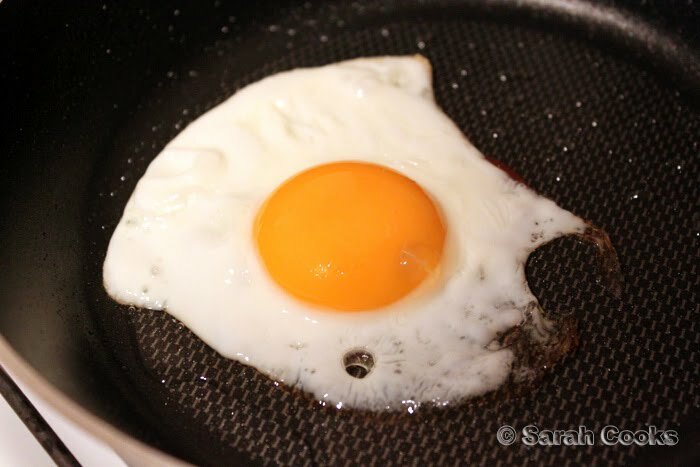 ... and a fried egg for Sandra. 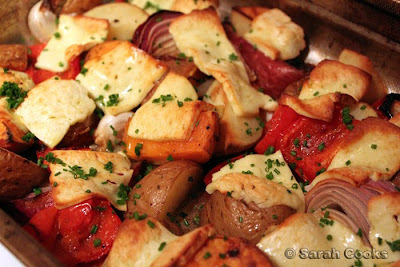 This was a super-comforting dinner, but surprisingly not too heavy! I think it helps that there's no meat, and that the cheese is sliced very thinly. I love the warm Autumnal colours of the dish, and the contrast between salty (halloumi), bland (potatoes) and sweet (sweet potatoes, red onion and capsicum). I sprinkled over some chopped chives for a colour contrast and some extra flavour, which I think was a good move. Absolutely fabulous. I must return to my Nigella books for more cooking inspiration! I love this dish! A good way of stretching out halloumi. And I definitely understand the whole "what the heck do I even cook" thing. I really need to plan a bit further in advance. 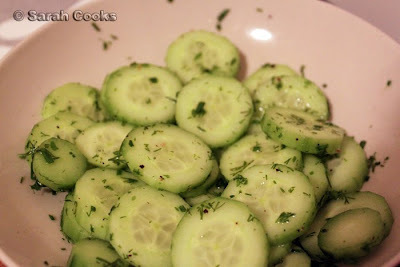 what herb did you sprinkle over the cucumber salad? Haha I can imagine you standing there deciding what to make. What's the ration of vinegar to sugar and other things for that pickled cucumber? Then it's just cream cheese and butter on the bread right? I have this same problem too, although it usually leads to me eating oatmeal for dinner, rather than getting takeaway :) I love the sound of this meal, though, particularly as I've been meaning to try halloumi (well, I ate it a few times years and years ago, but I want to reintroduce it to me)! I sometimes have that problem too, not knowing what to cook, I always like to find something a bit different too. Did you hear Nig's new book will be out next month? 500 pgs! Woot! Laura - Halloumi can be expensive, hehe this is a good way to use it up. I need to plan too. And oops, it's Sunday night and I don't know what I'm cooking this week. GRA! Anon - It was a mixture of chives and dill! Thanh - 1 tbs white wine vinegar, 1 tsp sugar, 1/2 tsp salt, lots of pepper, 1 tbs chopped dill. And yes, just cream cheese and butter on the bread. Jutta - You're right, the quality of the halloumi would be really important! Hannah - I think oatmeal would be a much more sensible dinner than what I've been eating lately! My Melbourne Restaurants - I think that's the challenge, finding something a bit different that's not too difficult or time-consuming! Lisa - Pre-ordered already!!!!!!!!!!!! Do I feel another project coming on? haha- I'm the same. Most weeknights I tend to flutter around the kitchen. If one ingredient is missing, even if not essential, I'd give up and get take out!!! Oh Good God, this is for me! i have been saying the same thing, i need to get back into my nigella books and start cooking! have you pre-ordered her upcoming cookbook?